What’s next for the most powerful unindicted co-conspirator in the world? Reminder: Popular Information is published Monday through Thursday. I’ll return to your inbox, bright and early, on Monday, August 27. If you like Popular Information, forward it to someone who might like it too. If you’ve been forwarded this newsletter, sign up at popular.info. Send your feedback to judd@popular.info. My friend Ryan Grim, an incredibly talented journalist and the D.C. bureau chief for The Intercept, writes a newsletter called Bad News. Ryan keeps you up to date on his frequently groundbreaking reporting. Occasionally, there is some good news. You can subscribe here. On Tuesday, Michael Cohen stood in a federal courtroom and said, under oath, that Donald Trump conspired with him to commit two felonies. At that moment, the commander-in-chief became an unindicted co-conspirator. It depends, of course, on how things develop from here. Robert Mueller’s investigation -- including possible conspiracy and obstruction of justice by Trump -- is ongoing. Michael Cohen is not done talking. And the 2018 midterms, which could radically change Congress, are just a couple of months away. But even the current set of known facts creates some unpleasant possibilities for Trump. So why wasn’t Trump charged? A memo written in 1973 by the Justice Department’s Office of Legal Counsel (OLC) argues that a sitting president cannot be indicted. “A necessity to defend a criminal trial and to attend court in connection with it … would interfere with the President’s unique official duties, most of which cannot be performed by anyone else,” Assistant Attorney General Robert G. Dixon Jr. wrote. Still, there is nothing explicit in the Constitution that grants the president immunity from prosecution. The Supreme Court has “never said whether the president can be indicted.” The same prosecutors in New York who charged Michael Cohen on Tuesday could also decide to file charges against Trump and challenge the OLC interpretation. According to some legal scholars, they might be successful. Alternatively, prosecutors could wait until Trump is out of office and then file charges against him. A more straightforward option is for Congress to impeach and convict Trump, removing him from office. Impeachment requires a majority vote of the House of Representatives. Conviction requires a vote of two-thirds of the Senate. Given the Republican majorities, it is hard to imagine the current Congress will impeach or convict Trump. Trump remains quite popular with the Republican base and, even after Cohen’s bombshell yesterday, Congressional Republicans seem content to justify or ignore Trump’s conduct. “I don’t think it implicates him at all, particularly on the Russia investigation,” Sen. John Cornyn (R-TX) said, “This doesn’t add anything to the allegation of misconduct relative to the Russia investigation.” If new facts emerged that revealed misconduct related to the Russia investigation, Cornyn, and his Republican colleagues, would likely move the goal posts again. There is, however, an election on November 6. If Democrats take control of the House, impeachment is possible, even likely. Conviction in the Senate, however, still requires two-thirds of the Senate and that would probably still be unattainable absent new allegations. State-level prosecution receives the least attention but should be a significant concern for Trump. The current Attorney General of New York, Barbara Underwood is already investigating the Trump Foundation. (She also filed a civil lawsuit against Trump and three of his children.) That investigation could be easily expanded to include Trump, the Trump Organization and any individuals, including Paul Manafort, who may be pardoned by Trump. Underwood’s office announced Wednesday that it had subpoenaed Cohen as part of the probe. BREAKING: New York state investigators have issued a subpoena to Michael Cohen as part of Trump Foundation probe. An important aspect to the criminal information against Cohen filed in federal court yesterday is that he received his reimbursement for illegal campaign expenditures through the Trump Organization. This appears to be evidence that the Trump Organization has acted illegally and thus beyond the scope of its corporate charter. New York State has an action, known as Quo Warranto, which allows the Attorney General to dissolve a corporation that engages in illegal conduct. I wonder if Trump has realized he’s going to lose the business. One of the candidates to be the next Attorney General, Zephyr Teachout, is one of the leading experts in public corruption. Teachout pledged that, as Attorney General, she would aggressively investigate Trump and his business ventures. If Donald Trump pardons Manafort, the federal pardon would not cover state crimes. As AG of New York, I will investigate and pursue any state law violations to be ready for Trump trying to protect himself with a pardon. We have to be totally clear that no one is above the law. It’s still possible Trump will get away with it. He could even get reelected. Cohen is saying that Trump conspired with him to commit two felonies. What is Trump saying? Trump made a few feeble attempts at implying that Cohen was lying, although he never detailed what, exactly, Cohen was lying about. Trump’s real argument, however, is that Cohen pleaded guilty to things that are not crimes. This is false. Prosecutors would not solicit a guilty plea for conduct that is not a crime, and a judge would not accept a guilty plea for conduct that is not a crime. This is the defense, however, that Trump is embracing. Hannity, as I’ve detailed, is one of Trump’s most important advisers -- they speak multiple times each day and his power rivals the actual chief of staff. If you hear an argument on Hannity, it likely has sign off from Trump. Last night, Hannity invited on right-wing talk show host Mark Levin. He argued that Cohen pleaded guilty to conduct that wasn’t a crime. It’s telling that they’ve embraced this argument, even though it’s wrong. The alternative is to claim that Cohen is lying. But they aren’t pushing that theory. Maybe that’s because Cohen is telling the truth? Trump’s ability to plausibly argue that he wasn’t conspiring with Cohen took another big hit on Wednesday evening. The Wall Street Journal reported that David Pecker, the chairman of AMI, told prosecutors that Trump knew about the payment his company made on Trump’s behalf to keep Karen McDougal quiet. In other words, it’s not just Cohen who is implicating Trump. It’s Cohen and Pecker. The evidence against Trump is mounting. Mollie Tibbetts, a 20-year-old student at the University of Iowa, was abducted while going for a run on July 19. Her body was found on Tuesday. The suspect for the murder is 24-year-old Cristhian Rivera. Authorities claim that Rivera is an undocumented immigrant. Expect to hear Tibbetts’ name repeatedly over the next two months. Republicans and President Trump immediately seized on Tibbetts’ death, casting it as a justification for their “zero tolerance” policy that separated over 2500 children from their parents. A young woman is dead, her family is grieving, and Newt Gingrich sees a political opportunity. The former House Speaker wrote to Axios’ Mike Allen and said that exploiting Tibbetts’ death was the best way for Republicans to distract from Cohen’s plea and retain their Congressional majority. We are living in two alternative political universes. In one, Manafort-Cohen is dispositive. In the other, illegal immigrants killing Mollie Tibbetts is dispositive. If Mollie Tibbetts is a household name by October, Democrats will be in deep trouble. If we can be blocked by Manafort-Cohen, etc., then GOP could lose [sic] house badly. Is Rivera an undocumented immigrant? Authorities say Rivera is an undocumented immigrant. But on Wednesday, his lawyer said he was in the country legally. He apparently passed an E-Verify check conducted by his employer. But his lawyer did not specify what kind of legal status Rivera had, and government officials were unable to locate proof Rivera possesses legal status. USCIS official on Cristhian Bahena Rivera: "We have found no record in our systems indicating he has any lawful immigration status." He may have been able to pass E-Verify with a stolen ID. Still, the exploitation of Tibbetts’ death started even before it has been definitively established that Rivera is undocumented. Please remember, Evil comes in EVERY color. Our family has been blessed to be surrounded by love, friendship and support throughout this entire ordeal by friends from all different nations and races. On Twitter, Tibbetts’ cousin also had strong words. Thanks for reading! Please send your feedback and hate mail to judd@popular.info. Or tweet your thoughts and include the URL popular.info. Today's Popular Information newsletter from @JuddLegum does a great job of laying out what Michael Cohen admitted to and how it relates to Trump. 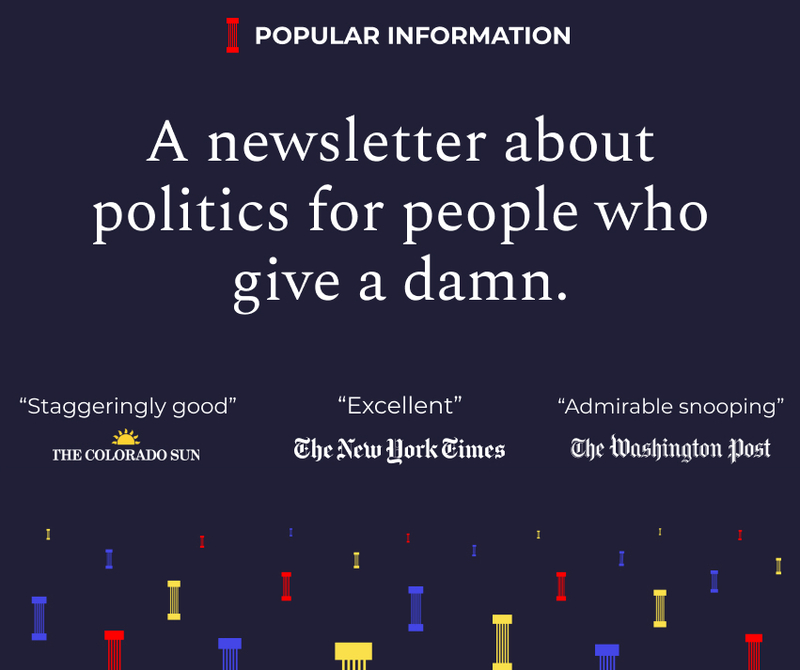 Have you checked out @JuddLegum's pithy, to the point newsletter Popular Information yet?